Prime Minister Imran Khan has said promotion of all fields of agriculture, including fisheries is the top priority of government. Chairing a briefing on fisheries in Islamabad today, he said the government will take all possible measures to facilitate people linked to fisheries to exploit their potential. The Prime Minister said it is also government's priority to promote bilateral cooperation with Beijing and to take benefit of China's expertise. 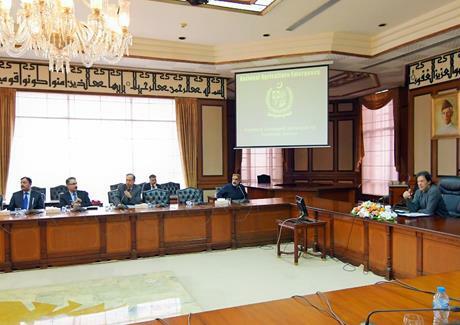 The Prime Minister was briefed about situation regarding fisheries and enormous potential of Pakistan in this sector. He was told that a comprehensive plan to promote shrimp and trout farming, and cage culture, which is part of PTI government's 100 days' agenda. It was said that this sector was ignored in the past due to which its ability to earn foreign exchange of worth billions of rupees. By promoting shrimp farming, cage culture and farming of trout fish in Gilgit-Baltistan and Azad Kashmir, food requirement of the country can be met and it can also help providing business opportunities to people.